First Line (from Introduction): It all began with a short story. Sometimes I just want to have fun while I'm reading, and when that mood swept over me this month, I found myself turning to Steve Hockensmith's collection of seven short stories about the Amlingmeyer brothers-- the cowboy detectives of the Old West. It did not disappoint. When reading the author's collection of Christmas short stories, I learned to read everything included so I wouldn't miss a single laugh, and the same thing holds true for Dear Mr. Holmes. Since most of these stories were originally published in Ellery Queen Mystery Magazine, there are several copyright notices. Read 'em. All of 'em. And the introduction contains not only a few chuckles, but the tale of just how Old Red And Big Red Amlingmeyer came into existence, which is very interesting indeed. 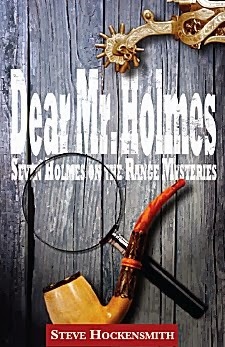 The seven stories contained in this collection are "Dear Mr. Holmes," "Gustav Amlingmeyer, Holmes of the Range," "Wolves in Winter," "Dear Mr. Watson," "The Water Indian," "The Devil's Acre," and "Greetings from Purgatory!" Every one is a gem. Each one is written in the form of a letter to various magazines of the day, or to someone like Dr. Watson himself, and Big Red invariably mentions a manuscript or story that he'd mailed earlier. He usually takes a while to shoot the breeze with the letter's recipient before he actually begins telling his tale, and as I read I couldn't help but think that I wouldn't mind receiving a few of these letters from that tall, red-headed cowpoke. The stories move from being hilarious to downright creepy, and the Old West feels so real that I swear I could hear the jingle of spurs as I turned the pages. If you've been intrigued by Steve Hockensmith's series of mysteries featuring two cowboy sleuths in the American West of the 1890s, but you haven't really wanted to invest the time it would take to read one of the books, this collection of short stories is an excellent place to start. Once you've sampled how Old Red and Big Red Amlingmeyer solve a case, I wouldn't be at all surprised if you headed straight out to the corral to rope a few of those books. It's real easy to take a shine to these two brothers. Cathy - Good to hear that this one gave you a fun read. I know just what you mean about wanting something a bit lighter to read. And the nice thing about short stories is that you can just dip into them when you have a moment. Glad you enjoyed this. I've got another Hockensmith short story collection and (I think) two more Holmes on the Range novels to read. The problem is staying away from them and not devouring them all at once! Hockensmith has a great sense of humor. Really enjoyed this one, as well as the others of this series that I've read. Have you read his collection of Christmas stories, Pepper?